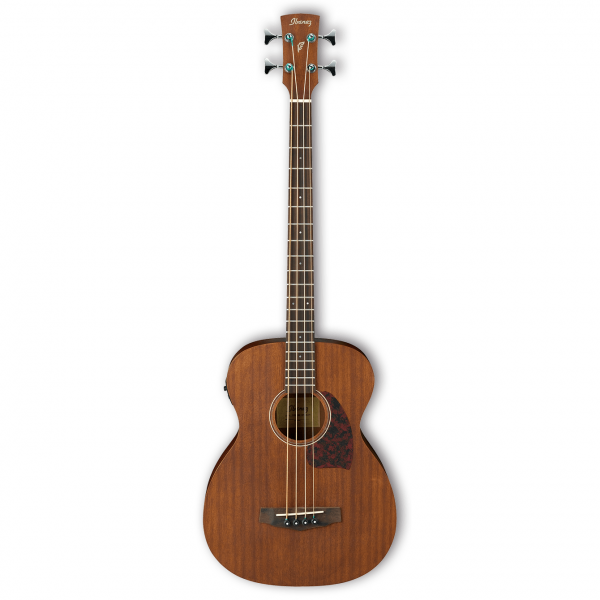 The Ibanez PCBE12MH is Grand Concert body style acoustic/electric bass with Mahogany top, back and sides for a warm, full tone. While the Open Pore Natural finish enhances the instrument’s natural beauty, it also contributes to the sound quality. Thick finishes can impede the vibration of a guitar’s body, choking the instruments tone and projection. The lightly applied Open Pore finish optimizes sound vibration and allows the bass to realize its full sound potential. Ibanez AEQ -202T preamp is specifically set to tailor the frequencies of a bass and allows operation of the built-in tuner without the instrument being plugged in. The PCBE12MH also features a tortoise rosette, chrome die-cast tuners, rosewood fingerboard and bridge, with Ibanez advantage bridge pins for improved tuning stability.